I was quite surprised that using a Wald test, there was no difference between the groups (p=1) - presumably due to the absence of events in one group. I wonder if anyone could advise me when it is appropriate to use each of these different statistical tests to generate a p-value? What are the underlying assumptions? Is there a good reference on this that you could direct me towards? The wald test produced a p-value of 1 because the fit was really really poor. You can see that in the coef field, where it's 19.91+/-4441. 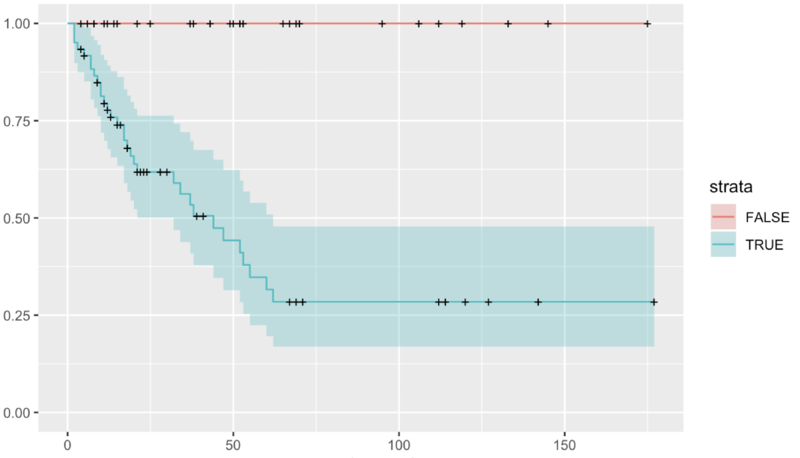 That's then leading to the really low Z value (19.91/4441 ~= 0.004) and thus the poor p-value. I don't know why the fit was so poor, but at least that's the reason for p=1. Indeed, when you are testing a dichotomous variable and one has no events, Wald test will invariably be 1 due to convergence, and should not be used. Take the log rank or LRT p-values. Makes sense, see also here. Confidence intervals on blue variable neither look great, though!